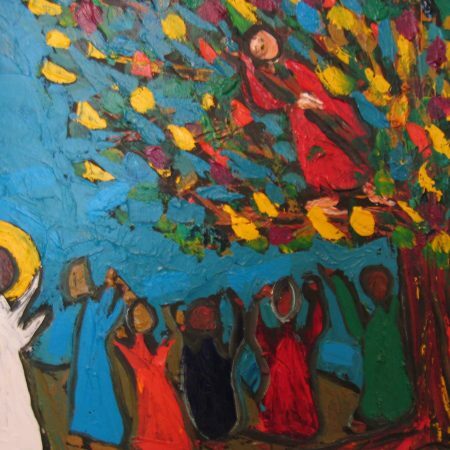 Was it Zacchaeus, or was it you, or me? Or maybe even our nation, our culture, our class, our tribe? Who paid for his latest renovation? It wasn’t our fault was it? to keep us one step ahead? Or are we running out of room to run? Have we played the same cards one too many times? What if all they say is true? What if this is your chance for a new life? For an end to watching your back all the time? How to avoid the crush? For that matter, how to see over the crowd? Bugger me, that really is one hell of a crowd isn’t it? I’m staying at your place tonight, aren’t I? How did he even know who you were? Are we guest or host? The Calling of Zacchaeus is one of my favourite Gospel passages. He was such a social outcast and so deeply resented yet Jesus befriends him and requests to dine with him. Thanks Nathan for a brilliant exposition. I thoroughly enjoyed your sermon. Thanks, Steven. When I launch out with a sermon as different as this one, I’m always a bit more unsure of how it is going across, so I’m grateful for your generous feedback. You should be on the stage Nathan! But then I remember that the Pulpit is your stage! Another wonderful performance Nathan. Thank you. Love your ‘ragged poetic sermons’. You should do them more often. Like your paraphrases, they awaken the ear and make us pay attention to the familiar in a new way.